ATTENTION DADS, STEP-DADS, FOSTER DADS, GRAND DADS, UNCLES, BIG BROTHERS, MENTORS & FATHER FIGURES!!! 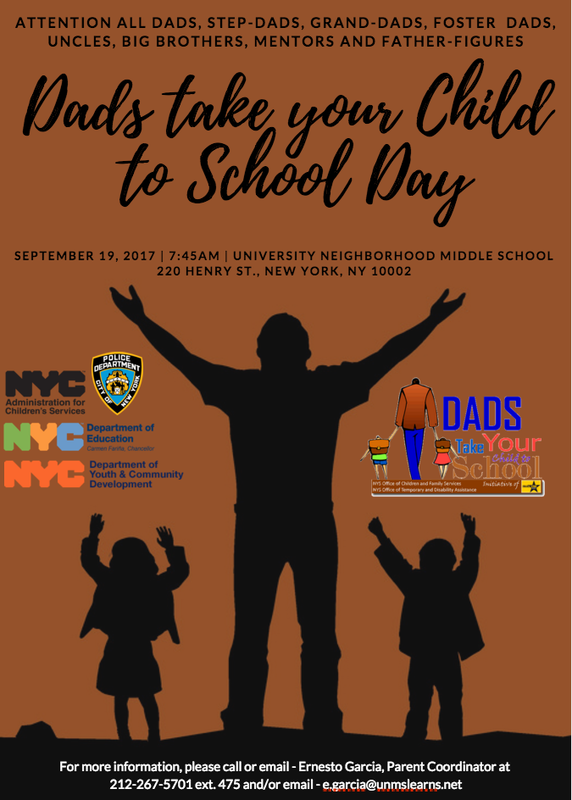 Dads Take Your Child to School is an annual event held throughout New York State celebrating the special relationship that fathers have with their children. It occurs at the beginning of the school year: inviting fathers, stepfathers, foster fathers, grandfathers, uncles, brothers, godfathers, and other significant male caregivers to accompany their child(ren) to school on a specific day, and encouraging them to make a commitment to participate in their child(ren)’s education throughout the year. Furthermore, studies show that actively involved fathers are a positive force in the lives of their children and their community.